Grabbing a morning train, we arriived in Florence; we found a hotel room for 37000 liras per night per person. Room rating: Good ..... nicely furnished, included a bidet. Since our Eurail pass was still good for the rest of the day, we grabbed a train to Pisa. And yes, the Leaning Tower Of Pisa is indeed leaning. It was also here we encountered some gypsy pickpocket kids (previously encountered in Rome). Of course, we easily spotted them coming and took evasive manouvers. Back in Florence, we visited the Accademia di Belle Arti, home of Michealangelo's masterpiece sculpture of David. Quite the sculpture, I must admit. There was nothing else special about this museum. The weather: it was mild and hazy. Viewed Florence from the Piazzale Michelangiolo. Click here to view the panorama of Florence from this viewpoint. In the evening of the 28th, we left for Nice, France (via Rome) on an overnight train. Our experience on the Munich to Venice overnighter told us to book a sleeper car (an extra charge). 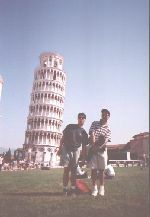 From Florence, we made a trip to Pisa, Italy. We visited the Leaning Tower of Pisa. As you can see from the picture, the tower's not leaning, it's the ground that is leaning. 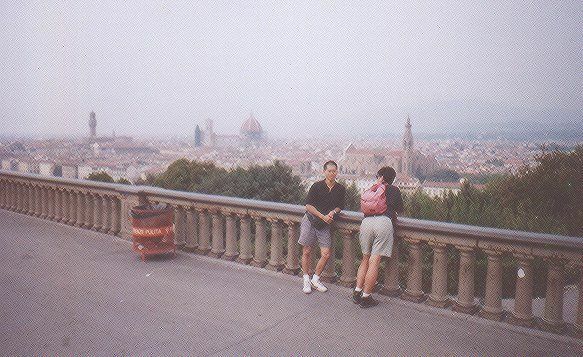 From the Piazzale Michelangiolo, the city of Florence sits in the haze. 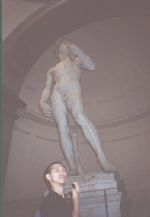 Michelangelo's masterpiece sculpture of David, at the Accademia di Belle Arti.